Thirty years ago this year, a band called The Wonderstuff made inroads across my eleven year old radar when they appeared in Smash Hits. They were uniquely witty and acerbic, and when I finally heard their music they were even better. In 1994, they called it a day…before reforming several years later. On one occasion my brother was privileged to have frontman, the legendary Miles Hunt, perform ‘Size Of A Cow’ for him in his hotel room. Which is pretty darn special, really. The band still evoke so many happy memories for so many people. A few months ago friends were round for dinner, and I put on their third album Never Loved Elvis. Within seconds of the needle hitting the vinyl my friends responded ‘Love this album.’ So do I, still. Mr. Hunt (we’re friends on facebook, and he seems much less frightening than I thought he might be), is shortly to release an album called The Custodian, on October 5.This features him doing acoustic versions of the songs he has written over thirty years or more. The version of ‘On The Ropes’, a top ten hit from 1993 is just amazing. 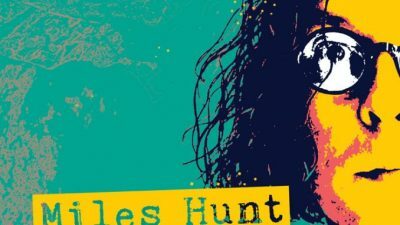 Oh, and I am getting to interview Miles Hunt this week. My week quite probably beats your year! This entry was posted in Miles Hunt, Wonderstuff by Ed. Bookmark the permalink.